MAKE THE CRUST: In a food processor, combine the flour, confectioners’ sugar, lemon zest and salt and pulse to mix. Add the butter and pulse in 1-second bursts until the mixture resembles coarse meal. In a small bowl, beat together the egg yolks with the water. Drizzle the yolk mixture over the flour mixture and pulse in 1-second bursts until the dough just comes together. Turn the dough out onto a work surface, gather any crumbs and pat into 2 disks. Wrap the disks in plastic wrap and refrigerate until chilled, about 1 hour. 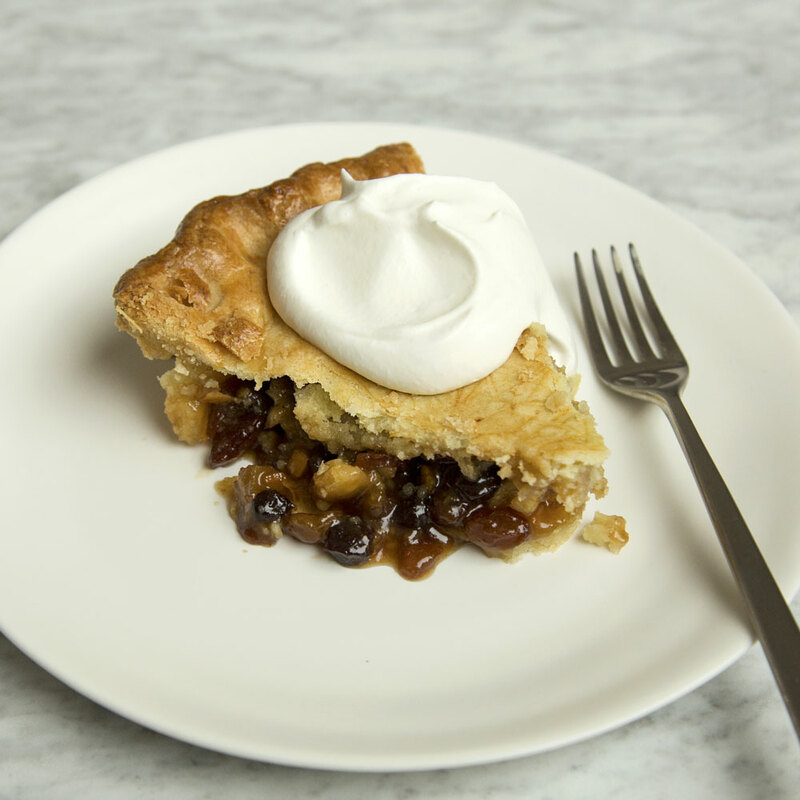 MAKE THE FILLING: In a medium bowl, mix the mincemeat with the apples and 3 tablespoons brandy. Preheat the oven to 425° and set a foil-lined baking sheet inside. Arrange piece of dough between 2 large sheets of plastic and roll out each to a 12-inch round about 1/8 inch thick. Fit 1 round into a 9-inch pie plate. Spread the filling in the pie shell, then top with the remaining dough round. Trim the overhang to 1/2 inch, then tuck the top edge under the bottom edge and crimp decoratively. Refrigerate the pie 30 minutes before baking. Brush the pie with the egg wash. Make 6 teardrop-shaped cuts in the top. Set the pie on the baking sheet and bake 20 minutes, then reduce the oven temperature to 350°. Bake for 40 minutes longer, until the pie is golden and filling begins to bubble. Transfer the pie to a rack and let cool completely. Just before serving, in a medium bowl, beat the cream with sour cream and the remaining 2 tablespoons of brandy until soft peaks form. Serve the pie in wedges with dollops of the brandy cream. The baked pie can be stored at room temperature overnight. Review Body: Just added to my to-do list.